Treasured for thousands of years, sandalwood is a uniquely fragrant wood known for its distinct color and its ability to support intricate carvings. 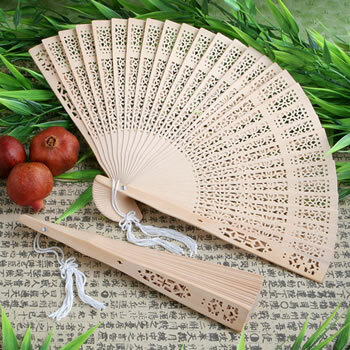 Each foldable, natural-sandalwood-colored fan measures approximately 8" x 14" and has an intricate carved design on its panels with a delicate white tassel attached to its handle. Perfect for summer occasions, outdoor wedding party favors, garden parties and much more, each Fashioncraft exclusive sandalwood fan favor comes packaged in a white gift box. Purchased these fans for an August wedding in Tennessee. Haven’t used them yet but they appear to be spot on and the bride loves the design. This one isn't as nice as the others I ordered,it seems not as well made, and I had to trim several of the plastic threads that hold it together. The 'sandlewood' on the interior of the fan is paper thin. I wanted a functional fan this isn't really functional. Some of the little lacy laser cuts have already broken. I purchased these for my summer wedding to make sure my guest can keep cool. They arrived promptly and exceed my expectations! They are beautiful and work great! I can’t wait to hand them out to my guest!! I’d highly recommend purchasing these fans. I received these in a very timely manner! The smell is so amazing. I am very much happy with them. Will totally order from this site again! I love this item! The smell of the sandalwood is enchanting. Very well made fans with gorgeous simple design. I would suggest attaching tags but if not sending them on the strings. It was a tad of a process to put together but the end result beautiful! I didn't use stretchy strings I disassembled the cord and attached that way. Very clean looking result. These were so beautiful and our wedding guests loved them! They arrived only two days after I ordered them and all of them wear in perfect working order. They do smell like sandalwood which makes sense but was an unexpected pleasant surprise for us! I’d highly recommend them! Can’t believe they were so inexpensive! Thank you. Love them. So much better than I anticipated based on some of the reviews. Love the intricate design. The fans are really pretty!! They are beautifully carved, come packaged in their own paper box which we kept them in until placing them in the Gift Baskets, because the sandalwood scent is just divine. They are so authentic, and were a perfect addition to our wedding Welcome Gifts, especially since the weather was forecast to be more than 80 degrees Fahrenheit!! Most guests brought their fans to the wedding ceremony! !They are also a very special keepsake! thank you! The only thing I would change is attaching the tags before shipping...I didn't realize I had to attach the personalized tags...No biggie and the fans are so cute! Thank you so much for the quick and perfect wedding favors for a hot wedding day. Even prettier than I expected. Will aid us in our outdoor June wedding. Love the delicate scent! These fans are terrific! Attractive, functional and they smell good. At first I thought I had some that didn’t work, but then I realized I was trying to open them backwards! So happy to have these for our guests! I could have bought these fans a lots of places but the reviews were so positive I thought I would give it a try. I am so glad I did! Fast service, quality fans with the extra white tassle makes it a great wedding favor, especially for an outside wedding. I wrote the bride and groom's name in silver on one end and their wedding date on the other end of the fan. Everyone has loved the smell, the beauty and they ask, Where did you get these? Nice wedding favor to keep after the wedding. Well worth it at a great price. It's easy to remember, Nice price favors! The fans came promptly. They were beautiful and a big hit at the wedding.